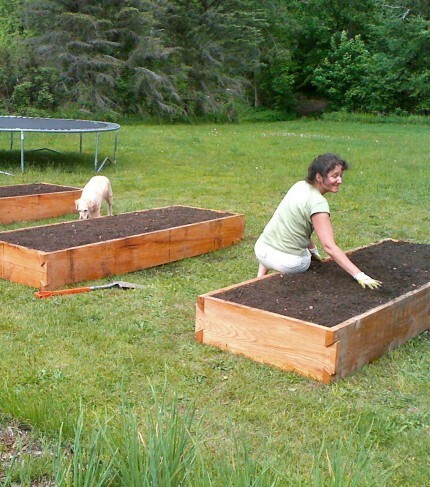 Three garden boxes shown ready to plant. These garden boxes with dovetail corners for raised beds are made of fresh-cut local Vermont Hemlock. Typically they are about 30 inches wide and 8 feet in length. They can be sized for your location. I have found that they will last six to eight years or more in a wet setting. The simple dove tail joinery locks the corners tight. Our method of installing flashing into the ground within the box keeps the garden soils from migrating out under the box should the box heave in the winter. Contact us for pricing. I only make them in the early spring only. So, plan ahead and order early.